Here's one simple tray bake recipe, made special by generous amounts of cinnamon and cardamom, and the lack of eggs. It's soft, tender and tasty. Choose the pinkest rhubarb you can find, and you're guaranteed one Pretty in Pink cake (note that I never peel my rhubarb stalks. Cannot see the point, unless they're very large and stringy, in which case it's better to avoid them anyway). Serve with icing sugar or vanilla custard. Keeps fresh for a few days because of the buttermilk content. Preheat the oven to 200 C/400 F. Line and/or grease a baking tray (ca 25-30 x 34 cm)*. Combine the kefir/buttermilk and melted butter. 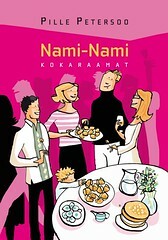 Combine the flour, potato starch, sugar, bicarbonate of soda, cinnamon and cardamom. Fold in the buttermilk mixture. 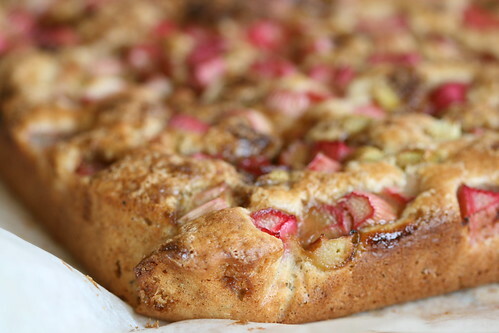 Pour or spoon the batter into the baking tray, scatter rhubarb on top and sprinkle with sugar. Place immediately into the oven (the baking soda starts reacting with the buttermilk as soon as they come into contact) and bake for 30-40 minutes, until the cake is golden brown on top. * I cooked mine in a baking tray sized 25x34 cm, but you could easily use a large tray. Reduce the baking time accordingly. Rhubarb cakes, yum yum! I'm partial to taking a standard recipe for gingerbread (can supply one if you wish) and folding lots of diced raw rhubarb into the dough. The "fruit" is so lovely with the molasses-spicy cake. I'm definitely going to try this -- my neighbor keeps offering rhubarb and I hate to turn it down, but have run out of ideas for how to use it. Cake is perfect! 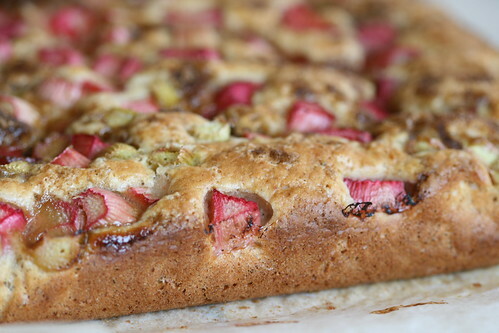 We have just added your latest post "Spiced Rhubarb Cake Recipe" to our Food Directory . You can check the inclusion of the post here . We are delighted to invite you to submit all your future posts to the directory for getting a huge base of visitors to your website and gaining a valuable backlink to your site. Heatherfeather - you're very welcome! Jackie - yes, it's a moist and rather soft-textured cake. Very comforting! Victor - that's a gread idea. I've got plenty of soft gingerbread recipes, so I'll experiment with this. Pille, looking forward to making it. just wanted to clarify the amount of potato starch.should it be in grams - it is in ml.\Thanks. Valentina, I didn't measure potato starch in grams, just used my millilitre measuring cup. An American cup is ca 250 ml, so 100 ml is 1/10 of a litre, aka a little under half a cup (or 7 even Tablespoonfuls). Very nice sharing and beautiful work. I like it. Your Cake recipe is awesome. I just start to use rhubard! 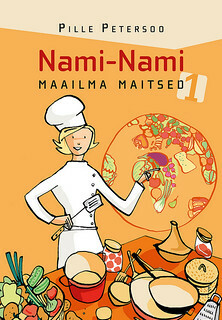 Thanks for your great recipe, it is so yummy.